These days it’s pretty rare to turn over a toy or kid’s gift and NOT see the words “Made in China” imprinted on the bottom. With China influencing more and more of kids’ learning and play interactions in this global economy, it’s no wonder that there are over 300 Chinese language apps available in the iTunes store. 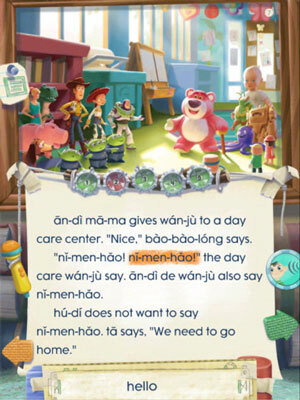 One fun new read-along app to help kids learn Chinese is from Disney Publishing. Learn Chinese: Toy Story 3 ($4.99 in iTunes) is the first in a planned series of new Chinese-language apps for the iPad, based on the Diglot Weave method of teaching a new language through a story. With Chinese vocabulary woven through Toy Story 3 stories, kids looking to begin learning the language can do so easily and have fun in the process. The app contains more than 100 vocabulary words all transliterated from Chinese characters into Pinyin (the English equivalent). You can manually set how much Chinese is displayed in your story - if you want to start slow, you can read the story completely in English, then slowly add Chinese words and work your way up to learning, reading and speaking full sentences from the story in Chinese. If you’re stuck on a particular word, or forget its meaning, you can "ﬂick" words from the story down to a translation box located at the bottom of the screen. If your child has the words mastered, but is not confident in their pronunciation, the app lets you record your voice and compare it against the audio narrator’s pronunciation. Learn Chinese: Toy Story 3 has some additional features to keeping learning fun, like getting rewards for completing levels. Disney recommends the app for 7 years of age or older, but many preschoolers already learning Chinese, and familiar with Buzz and Woody will be enthralled by it. Disney plans to expand to other tablets and offer more language learning apps with Disney characters too.